Katherine Chou is in many ways the quintessential Googler – super smart, a passion for computer science, an engineer through and through. 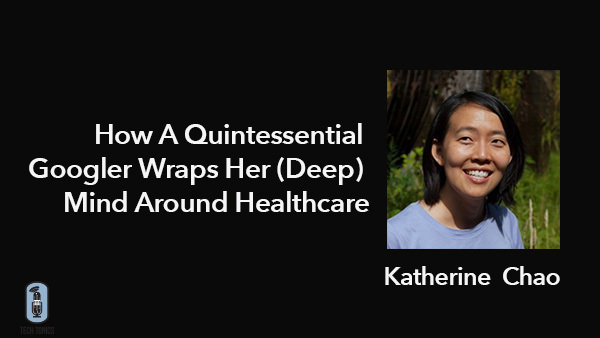 On today’s episode of Tech Tonics, we’ll learn how this rock star at Google decided to turn her talents to healthcare, and hear what she’s discovered about healthcare, and herself, along the way. The daughter of two aerospace engineers, Katherine had her first computer (a 32 bit Amiga 1000) when she was four, and apparently figured out how to program it not long after that. A whiz kid, she seems to have excelled in most everything in and out of the classroom. She took math and science courses in college while still in high school, while also pursuing piano, ballet, tae kwon do, and Science Olympiad, among other pastimes. She attended Stanford, where she double-majored in economics and computer science (CS), which she discovered was her true passion. She continued on to a Masters in CS at Stanford, and after an initial role at Microsoft – which she chose because she wanted to manage, and not just code – she joined Google (pre-IPO) in 2004, and has been there ever since, in roles of increasing responsibility. Today, she Head of Product for Health Research and Medical Brain, and closely involved with many of the high profile efforts (such as analyses of retinopathy and of EHR records) that have attracted so much popular attention. On today’s show, Katherine shares her vision and her passion, as well as the (very structured) approach she’s taken to many of the key choices she’s faced along the way. We are delighted to welcome Katherine to Tech Tonics! Today’s episode is sponsored by DNAnexus, the secure and compliant cloud platform that enables enterprise users to analyze, collaborate around, and integrate massive amounts of genetic and other health data.